Nancy Walsh takes us on a chilling journey inside the mind of a fascinating, lucid woman who is slowly losing her grip on reality but thinks quite the opposite. In an astonishing, powerhouse performance by a superb actress (and private investigator in a parallel career), we are made aware of the fine line between reason and unreason. Susan is a very normal young woman having a very difficult day. She has seen through the mask of symbols and is fighting to decipher a personal and ruthless message from dead gods - while conducting a university lecture in front of a particularly unruly class. The audience is her class and will bear witness, not to a lecture, but to a brave and desperate final struggle against demons only she can see. A sharp, fast, funny and ultimately harrowing trip into the mind of a woman who suspects she is the only sentient being in existence and, ultimately, feels she is able to prove it. Nancy Walsh, returned to Edinburgh in this heartbreaking and galvanising tour de force. Her husband, John Clancy directed. Two weeks prior to opening, Nancy collapsed during rehearsals and underwent a life saving operation to remove a large brain tumour. Just one month later, with her husband involved in 3 other productions, she insisted on opening her show to critical acclaim. 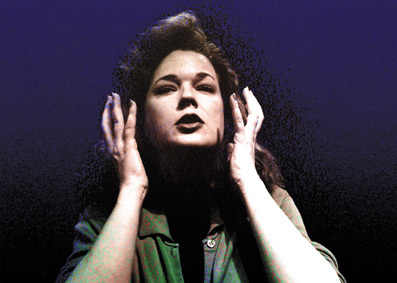 She was given the Jack Tinker Memorial Spirit of the Fringe Award, Edinburgh's highest accolade, a Scotsman Fringe First, and received a nomination from The Stage for Best Actress.